Prime Minister Freundel Stuart to Barbados: I don’t care about conflicts of interest, Leroy Parris is my long time friend. Lesson #492 why the DLP won’t pass Integrity Legislation and political financing rules. Ever. Barbados PM protecting one of the DLP’s prime financial backers. Like Finance Minister Sinckler, our accidental Prime Minister Freundel Stuart just doesn’t get it or doesn’t care about Integrity Legislation, Conflicts of Interest and the optics of senior Ministers of Government cavorting with someone who at the very least is at the center of a scandal involving billions of dollars missing, and who should be under serious investigation. But it’s okay because Leroy Parris is “a long-time friend and a one-time client” – not to mention a major financial supporter of the Democratic Labour Party. Oh… Stuart didn’t mention that financial support to the DLP, did he? Prime Minister Stuart says it doesn’t help the CLICO situation to try to exploit a photograph of Minister of Finance Chris Sinckler talking to Parris (photo above) at the just run Gold Cup horse racing event. Stuart doesn’t mention that the photo was taken at a private little gathering where ordinary folks weren’t invited. He tries to make it like they just bumped into each other on the street. So according to Prime Minister Stuart, victims and taxpayers should just shut up about CLICO conflicts of interest and if they don’t, the PM will blame the victims when they receive pennies or nothing on their “investments”. That’s quite a different response than taken by the Government of Trinidad & Tobago, that set up a Commission of Enquiry to look into the CL Financial – CLICO debacle: including the examination of how relationships, conflicts of interest and election financing concerns contributed to the collapse. What is it that causes Mr. Stuart to tell ordinary Barbadians that the relationship between government and Leroy Parris is none of their business? Is it “honour amongst thieves” and all that? 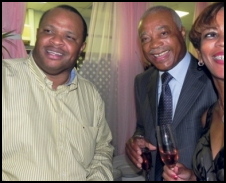 Or is it that Leroy Parris and CLICO funded the DLP election campaign that saw David Thompson made Prime Minister? Is it a combination of factors all working together that causes Mr. Stuart to tell ordinary Barbadians that the relationship between government and Leroy Parris is none of their business? Ladies and gentlemen of the Democratic Labour Party: please excuse us for bothering you. Please continue to enjoy your champagne, lobster pate and your close relationship with the people who stole our future. Sorry for mentioning it. Truly. Abdul Karim is a piece of history they never taught us in school! I only heard of Queen Victoria’s footman-lover John Brown when the movie Mrs. Brown was released in 1997. I wasn’t surprised that Victoria took a lover after the death of her husband. She was only 42 years old when Prince Albert died and at 42 years old no woman is ready to go it alone for the rest of her life. Not me anyway and not Victoria but when we learned about Queen Victoria in history class the teacher skipped the part about Mrs. Brown. Queen Victoria was a woman with lots of, “energy”! My history teacher also skipped the part about Queen Victoria’s Indian lover, Abdul Karim, (called “the Munshi” that is “teacher”) but thanks to a gift from Marcus I’m reading all about the last scandal of Queen Victoria. My newest book on the nightstand is “Victoria and Abdul: The True Story of the Queen’s Closest Confidant”. I started it two days ago and I can’t put it down. I haven’t gotten to any naughty parts yet. I’ll let you know when I do! Regular readers are familiar with BFP contributor Afra Raymond (photo above) and his tireless efforts to shine sunlight into every dark hole and crack in the CL Financial – CLICO debacle. There’s no hyperbole with Afra: he digs for the facts and then presents those facts, along with some conclusions or questions. His agenda seems to be nothing more or less than discovering the unvarnished truth about what happened along with other basic questions like who, where, when and why. When stonewalled Afra submits Freedom of Information requests and when those get ignored he submits them again and again, perhaps following up with a lawyer’s letter. He is a terrier who will not let go and will not be deterred by the occasional kick. We need more terriers acting in the public interest for no other reason than the truth needs to be set free for the good of all. Simple truths, exquisitely researched and powerfully presented: no wonder some folks didn’t want Afra writing in the news media or hosting television shows in Trinidad. It’s not an exaggeration to say that without Afra and others like him there would be no Trinidad and Tobago Commission of Enquiry into the failure of CL Financial. Now Afra Raymond is seeking to be made a party to the Commission of Enquiry into the failure of CL Financial Limited et al.